Please take a look at Directorates and Branches of Indian Army Organization. Deputy Chief of Army Staff DCOAS(P&S) includes Director General of the Defence Intelligence Agency(DDG DSC) which was set up after the Kargil War. The idea is that of integrating defence intelligence gathering. 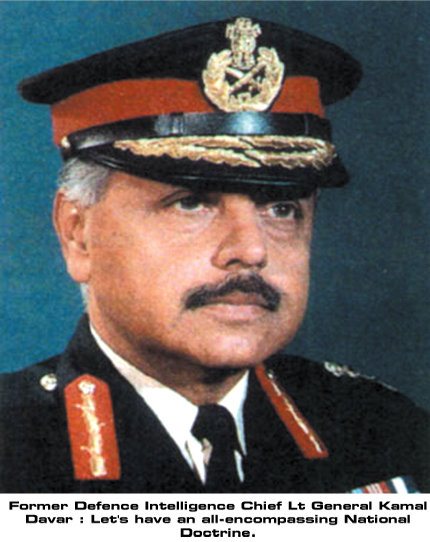 Lieutenant General Kamal Davar was appointed as Director General DSC on March 05, 2002. He recommended all-encompassing National Doctrine to meet with India’s Intelligence Gathering demands. Defence Intelligence Agency – Know Your Enemy. General Kamal Davar recommended formulating comprehensive ‘National Doctrine’ for India’s Intelligence Gathering. Defence Intelligence Agency – Know Your Enemy. 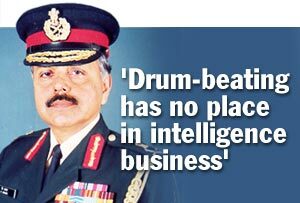 India’s first Director General of the Defence Intelligence Agency. Intelligence demands keeping tabs or a tab which means to keep a check on, follow or watch every move. The primary mission of Armed Forces is that of fighting War or defending against War. To perform this duty, Armed Forces draw authority or power sanctioned by Constitution of India which created posts such as President of India, and Prime Minister of India. In Army, we are trained to receive orders given by a Superior Officer and there is an obligation to reject illegal orders. In ultimate analysis, legality of any order including orders issued by President or Prime Minister depend upon their allegiance to Constitution of India that created Republic of India. To accomplish their sacred duty, to fulfil their obligation, Army Establishment( just like the Supreme Court of India) has to recognize the Supreme Authority, the Supreme Power, and the Supreme Law of Republic of India. Director General DSC has the obligation to gather intelligence, to keep tabs on all Indians including President, and Prime Minister as Republic of India can potentially face threats from both internal and external sources, known or unknown. DDG DSC has to know activities of politicians as well as those of Police and various kinds of security forces operating in India. Armed Forces has to keep tabs on their own personnel as a matter of principle. Director General DSC has to know as to what is going on within the organization to prepare for eventualities. DEFENCE INTELLIGENCE AGENCY – KNOW YOUR ENEMY. LIEUTENANT GENERAL ANIL K BHALLA WAS APPOINTED AS DIRECTOR GENERAL, DEFENCE INTELLIGENCE AGENCY ON JANUARY 02, 2014. 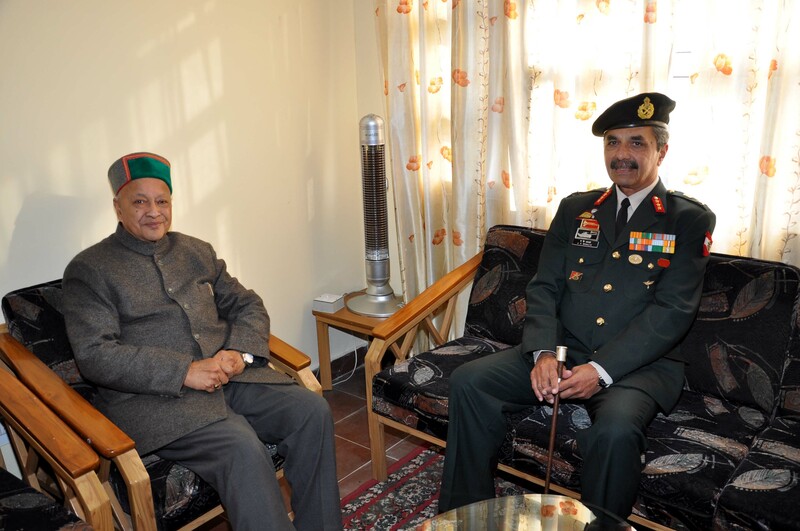 HE IS SEEN WITH CHIEF MINISTER OF HIMACHAL PRADESH IN PHOTO IMAGE OF JANUARY 08, 2013. Director General DSC should not be a ceremonial appointment. This Branch requires more personnel to gather intelligence from a variety of sources. Today, I do not see that kind of Intelligence or Intelligence gathering effort to monitor suspicious activities that endanger National Security. We are not prepared to face security threats. The attack on IAF Pathankot Base shows that we have not gathered any relevant intelligence even after creating the Defence Intelligence Agency. India immediately needs National Doctrine on Intelligence. INDIA’S CIVIL_MILITARY DISSONANCE: ROAD TO PERDITION? DEFENCE INTELLIGENCE AGENCY – KNOW YOUR ENEMY. INDIA NEEDS ALL-ENCOMPASSING NATIONAL DOCTRINE FOR INTELLIGENCE GATHERING. 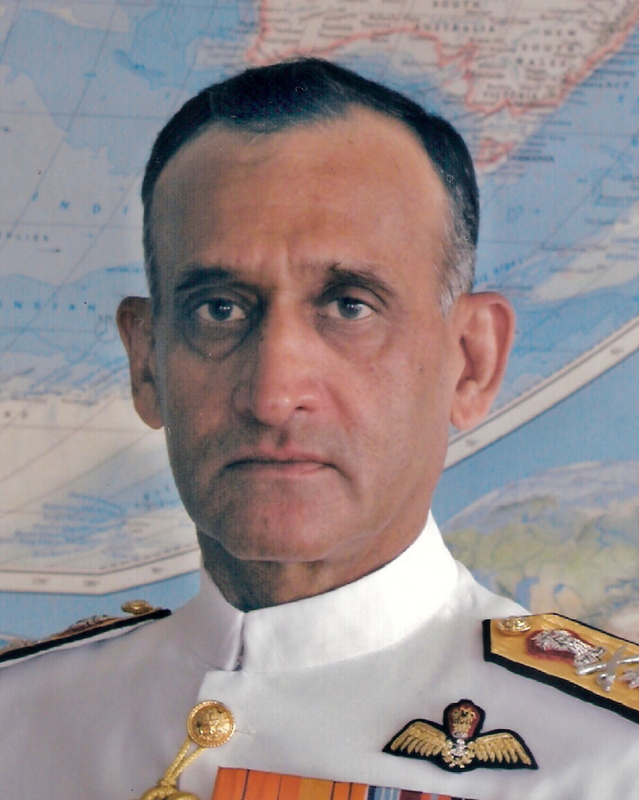 ADMIRAL ARUN PRAKASH OF INDIAN NAVY. The calibre of a nation’s leadership is tested by a crisis. Whether it is floods, an aircraft hijacking or a terror strike, India’s response to any crisis has followed a depressingly familiar sequence. Regardless of intelligence inputs, the onset of a crisis finds multiple agencies pulling in different directions, lacking unitary leadership, coordination and, above all, a cohesive strategy. Ad-hoc and sequential damage-control measures eventually bring the situation under control, with loss of life and national self-esteem. After a free-wheeling blame-game, the state apparatus relapses into its comatose state – till the next disaster. Whether or not India-Pakistan peace talks are resumed, the Pakistani ‘deep state’ has many more ‘Pathankots’ in store for India. For Pakistan’s Inter-Services Intelligence (ISI), cross-border terrorism is an inexpensive method of keeping India off-balance. The strategy of plausible deniability and threat of nuclear ‘first-use’ assures them of impunity from retribution. Such situations call for all components of India’s national security, military, intelligence, bureaucracy, central and state police forces to work in the closest synergy and coordination. Regrettably, civil-military relations have, of late, been deeply vitiated and the resultant dissonance could have adverse consequences for the nation’s security. Worldwide, an unmistakable distinction is maintained between the appearance and functions of the military and civilian police, the latter being charged with the maintenance of law and order, crime prevention/investigation and traffic regulation et al. India’s unique security compulsions have seen the Indian Police Service (IPS) not only retaining the colonial legacy of sporting army rank badges and star plates but also garnering unusual influence in national security matters over the years. Many of our Central Armed Police Forces (CAPFs) have blurred the distinction between police and military; terming themselves ‘para-militaries’, with constables wearing military style combat fatigues and being addressed as ‘jawans’. There are only three, duly constituted, para-military forces in India: the Coast Guard, Assam Rifles and the Special Frontier Force; all headed by armed forces officers. The five CAPFs, namely BSF, CRPF, ITBP, CISF and SSB – cumulatively over a million strong – are headed by IPS officers. A second anomaly in the civil-military matrix pertains to the fact that the Government of India Rules of Business have designated the civilian secretary heading the defence ministry as the functionary responsible “for the defence of India and for the armed forces”. Since no military officer, including the three chiefs, finds mention in the Business Rules, the Service HQs are subaltern to a 100 percent civilian ministry. Every major decision – whether it pertains to finance, acquisition, manpower or organization – requires a ministry nod which can take decades. A false and dangerous belief prevails on Raisina Hill that civil-military relations constitute a zero-sum game in which ‘civilian control’ is best retained by boosting the bureaucracy and police at the expense of the military. Post-independence, the civil-military balance has been steadily skewed by pushing the military officer well below his civilian counterparts with the same years of service. This has caused deep resentment in the military, and the resultant hierarchical distortion could lead to a civil-military logjam – the last thing the nation needs at this juncture. It is high time the Indian politician shed his traditional indifference to national security issues and took tangible measures to ensure a stable and equitable civil-military paradigm – one which ensures a say for the military in matters impinging on the nation’s safety and security. Until that happens, the Republic Day parade will remain a vainglorious display of hardware and pageantry – and the nation’s security in parlous straits. Posted byWholeDude January 30, 2016 January 30, 2016 Posted in55 Medical Battalion-First Armoured Division-The Black Elephant Division, 84 Field Hospital, 54 Infantry Division - The Bison Division, A O C Centre-Secunderabad, Army Medical Corps Centre and Officers Training School Lucknow, Military Hospital-Ambala Cantt, Special Frontier Force-US-India-TibetTags: Know Your Enemy, National Doctrine for Intelligence, What is Military Intelligence?